The battle in Syria's skies Jump to media player The battle in Syria's skies explained in 60 seconds. Russians fire on Syria from Caspian Jump to media player Russia says it has launched rocket strikes on Islamic State group targets in Syria from warships in the Caspian Sea. Who is fighting whom in Syria? Jump to media player Who’s fighting whom in Syria? Jonathan Marcus explains in 90 seconds. Why so-called Islamic State chose to conduct a mass execution in the amphitheatre at Palmyra in Syria Jump to media player The power of the Islamic State propaganda machine - Charlie Winter of the Quilliam Foundation, a counter-extremism think tank. So-called Islamic State group (IS) has shifted its propaganda distribution to the secure mobile messaging app Telegram from Twitter, where its accounts have been repeatedly shut down over the past year. IS appears to be exploiting a new tool introduced by the app last month, which allows users to broadcast their messages to an unlimited number of members via their own Telegram "channel". IS appears to be hoping the Berlin-based Telegram will offer it a more stable and resilient platform for its propaganda, faced with a sustained clampdown on its Twitter presence. But Telegram itself suggests it will take down illegal material that is made publicly available via the app - including posts related to IS, according to its website. 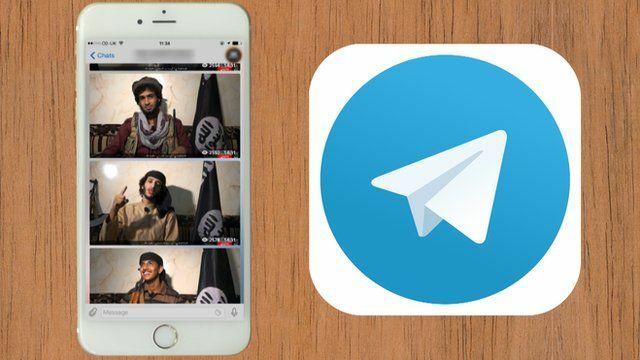 BBC Monitoring looks at how IS has started to use Telegram as its first point-of-call for spreading its propaganda.